High-gloss laminates continue to be very popular, and this project in a loft in Toronto’s Liberty Village is a great example of using high-gloss to its strengths. We designed and installed two areas in this loft, a home office that doubles as a wardrobe, along with built-in bar and linen storage in the other room. 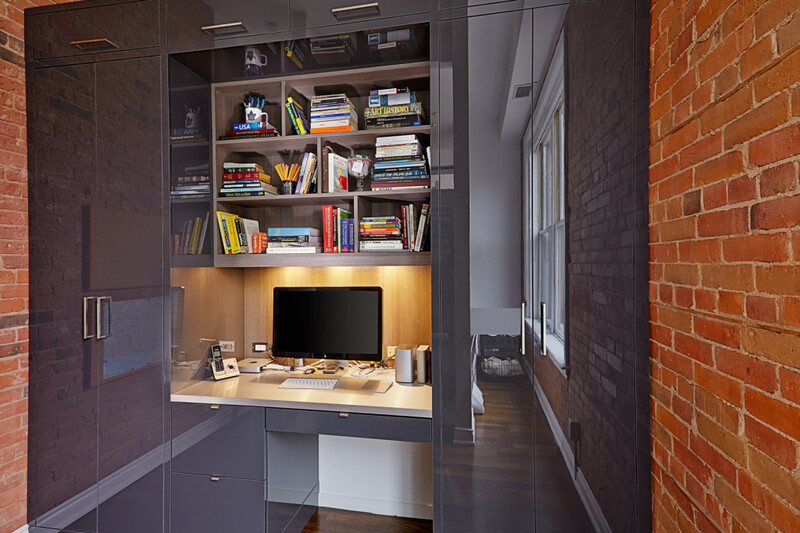 This home office installation doubles as a bedroom work station and wardrobe. 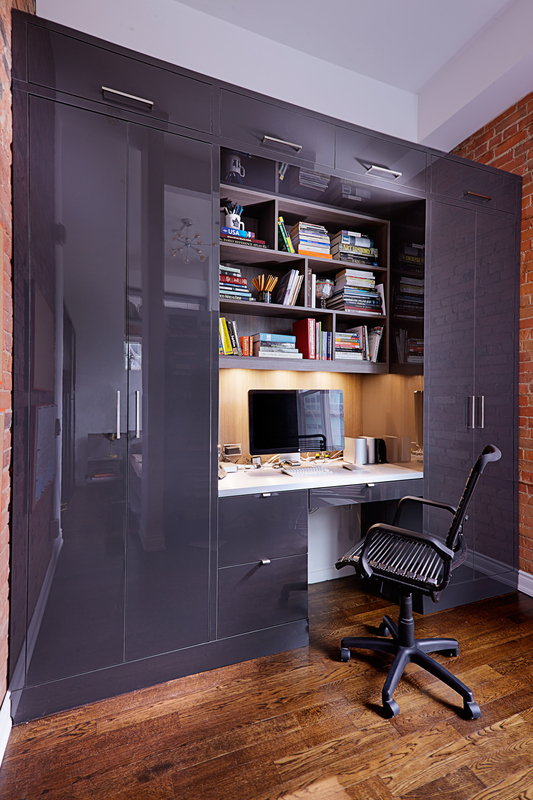 Wall to wall cabinets in a converted factory loft space, this nook in the bedroom creates a dynamic home office. The cabinet exteriors use a high-gloss melamine called Antracita. The recessed open shelving is a textured woodgrain laminate, this one is called Castellina, and the desk surface uses a formica Stainless Steel laminate. The upper doors lift upwards on stays, and we used stainless steel pulls and handles on drawers and doors. We used LED puck lights over the work surface for task lighting. The high-gloss finishes provide a modern contrast to historical brick. 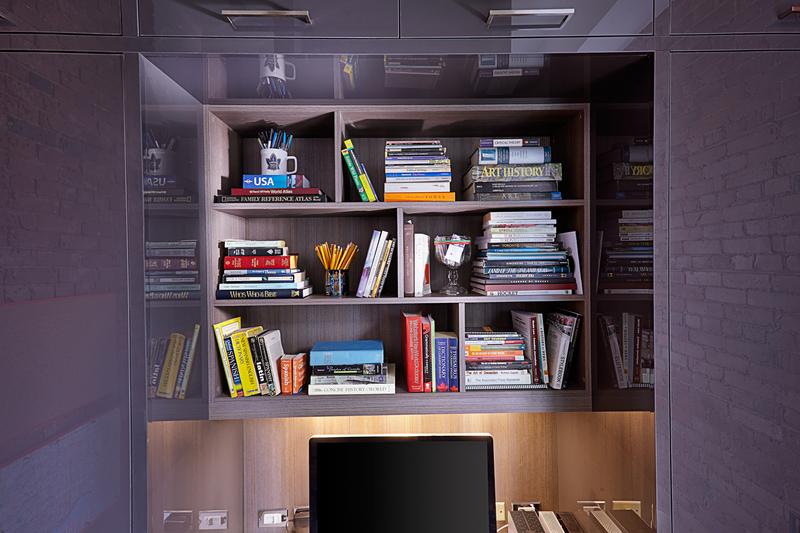 Using woodgrain laminates for the open shelves provides a further interesting contrast. Outside the bedroom, we also built two custom cabinets in alcoves that straddle the entrance to the bathroom. 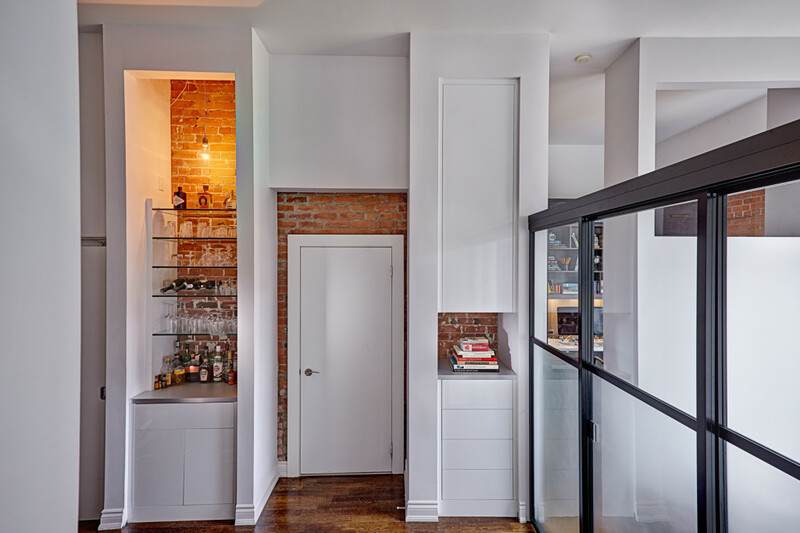 On the right side, we built a tall upper structure that serves as linen storage with drawers below, divided with an exposed brick area and another stainless countertop. On the left side of the bathroom entrance we built a bar. High-gloss cabinets take advantage of the height and bridge the entrance to the bathroom. The client supplied an industrial hanging light, which shines through the glass shelves that sit in front of yet more exposed brick. Additional enclosed storage sits below another stainless counter, and all doors and drawers in these cabinets feature handle-less, touch-latch hardware for clean lines. The white high-gloss laminate flows with the rest of this space nicely, leaving the exposed brick and the stainless counters to be the features, whereas in the bedroom, the darker high-gloss laminate on the home office is the defining feature, making the desktop and brick secondary. Linen storage is situated between the bedroom and the bathroom. 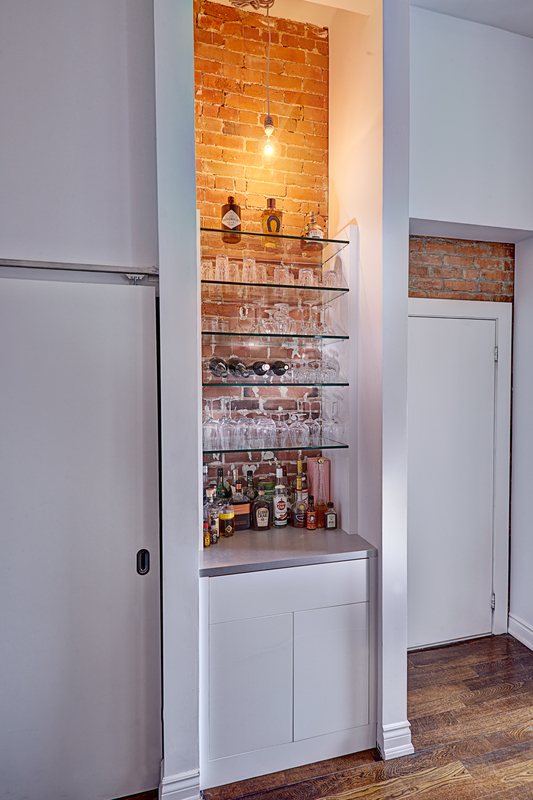 This custom bar area features glass shelves in front of exposed brick for a classic look. 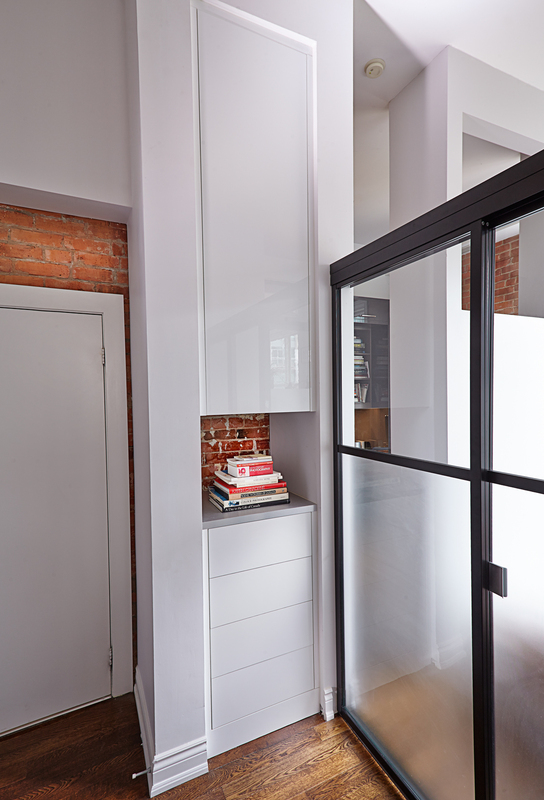 High-gloss laminates come in a variety of colors, and are ideal for converted lofts such as this. Ready to get started on your own custom built-in wall unit? Call us during business hours at 416.322.5575, or after hours, use this handy form to request an in-home consultation!